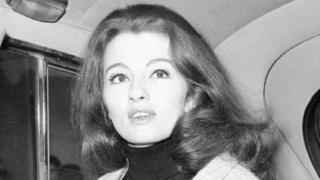 Christine Keeler, the model embroiled in the 1963 Profumo affair, has died aged 75, her son has said. Seymour Platt said Ms Keeler had been ill for several months with chronic obstructive pulmonary disease. He told the BBC: "She was always a fighter, but sadly lost the final fight against a terrible lung disease." She became famous for her part in the scandal, which shook Harold Macmillan's government, but her son said that fame came "at a huge personal price". At the height of the Cold War, the-then teenager claimed she had an affair with Conservative cabinet minister John Profumo. She also claimed to be in a relationship with a Russian diplomat - Eugene Ivanov, an assistant naval attaché at the Soviet Embassy - at the same time. Mr Profumo was forced to resign after lying about the affair to Parliament and the scandal is considered to have contributed to the fall of the Macmillan government. Ms Keeler's family said she died on Monday at 23:30 GMT at the Princess Royal University Hospital in Orpington, south-east London. Paying tribute to his mother, Mr Platt told the BBC: "She earned her place in British history but at a huge personal price." "And regardless, we are all very proud of who she was to the end," he added. Douglas Thompson, the journalist and author who worked with Ms Keeler on her memoir The Truth At Last, paid tribute to a "funny and bright" woman, whom he described as "one of the most honest people I have ever met". "She believed absolutely everything she ever said about the Profumo affair," he said. "She said what she thought," he continued. "I think that honesty is very surprising." He described Ms Keeler as a "victim of the time", adding that she would probably have had her own TV show had the scandal happened today. "The interesting thing about her is she tried to escape it," he said. "I don't think she ever got away from it - that was a tragedy." "She could never stop being Christine Keeler," he added. In 1963, Mr Profumo told the House of Commons he and Ms Keeler were "on friendly terms" and there was "no impropriety" in their relationship, after opposition MPs voiced concerns about national security implications. Eventually he admitted lying to the house and resigned as Secretary of State for War and from the Commons. Ms Keeler was briefly married twice, with both ending in divorce. She had two sons. The Profumo affair will be the subject of a BBC One drama which begins filming next year.